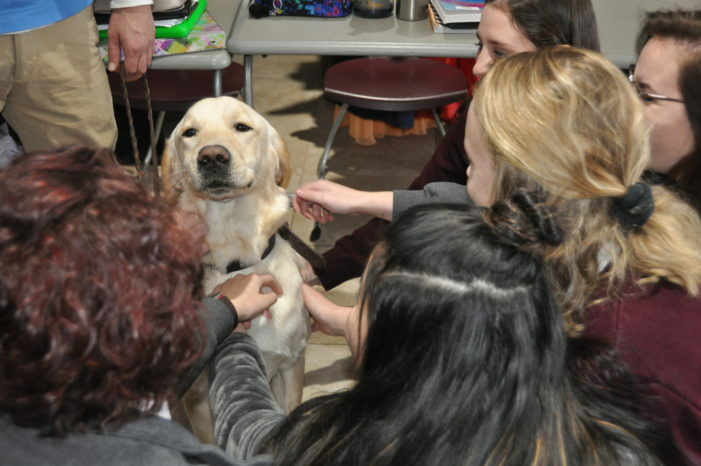 Eric Rodman and Ashley Ayers, dog trainers from Leader Dogs for the Blind in Rochester, visited Everest Collegiate High School & Academy with some of their furry students on Jan. 10. These dutiful pups – Cricket, Iris, Hope Francine, and Korky – spent four months of their lives learning how to lead clients with visual impairments. Rodman and Ayers demonstrated some of their training at Everest in hopes these puppies would also become masters in the classroom, since some are going to clients who spend their days in schools. Everest students saw the dogs find doors, navigate around obstacles, and focus on attending their handlers in every situation. The Labrador Retrievers and lab mixes will soon be paired with their new owners as their guide dogs. One Response to "Leader dogs learn how to show the way"
What a “ win win” experience for all, including puppy raisers across the Midwest.